Surfers Paradise is considered the Gold Coast's most popular destination. The relaxed lifestyle, incredible weather year-round and amazing beaches make it one of the most popular tourist spots in Australia. It's not hard to find a Surfer's Paradise hotel close to the action. With so much to see, do & experience, you will never run out of things to do in Surfers Paradise. Surfers and beach fanatics need look no further, with prestigious Surf Lifesaving competitions taking place throughout the year and glorious stretches of beach - there's no excuse not to head down and soak up the sunshine. The new Surfers Paradise foreshore was recently refurbished and is now home to an array of beachside shopping, restaurants, cafes, bars & clubs, so you'll never be short of a new place to explore. There is Surfers Paradise accommodation located within walking distance to all attractions and adventures you seek on your trip. Make sure to plan ahead, there are festivities throughout the year hosted around the area including Christmas and New Year celebrations, music events and surfing competitions. You are guaranteed a fantastic holiday when you stay at a Gold Coast Surfers Paradise hotel from AccorHotels. The possibilities are endless when you holiday in one of Australia's most exciting cities. Discover our selection of luxury to budget Surfers Paradise hotels for your next business trip, family getaway or weekend escape. 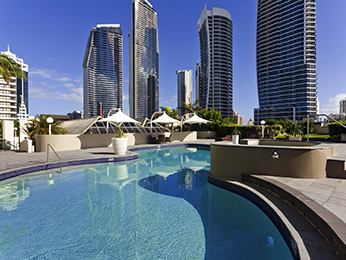 Discover the best hotels in Surfers Paradise, stay with AccorHotels.